Italian Face-to-Face Strat-O-Matic Pro Football League. In the autumn of 1986 some players of the original Venetian (American) Football Team named VENEZIA MARINERS, discovered Strat-O-Matic Pro Football board game, and loved it so much they started their own face-to-face league. They chose 10 differently ranked NFL teams of those times, and drafted skilled players (QBs, WRs, RBs, TEs), the Offensive Linemen & Specialists Cards and the Defensive Team Cards. The original five members (Alessandro Novello, Giorgio Salvadego, Giampaolo Veratelli, Rino Villa and Giulio Filippi) staged a 10 Weeks schedule, playing their first Superbowl being hosted at the Bergamo Fair during the "Ludus" gaming extravaganza. 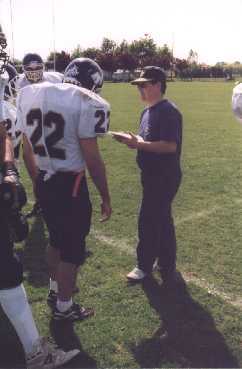 Inthe first few seasons the league used the straight S-O-M Super-Advanced rulebook, then they discovered the consitution/rulebook of the Greater Madison Football Association from Madison, Wisc., which allowed greater flexibilities for the offensive and for the defensive formations. In 1997 the I.F.L. introduces the TOTAL DRAFT for all the positions: each manager is allowed to pick whoever he wanted with each of his own draft picks. In the past only skilled players were freely draftable. During all these years many managers have joined and left the league. We'd like to remember here Daniele Pagnutti, the well-known Italian chastiser of S-O-M Pro Fotball, and his everlasting motto he pronounced constantly during his IFL tenure (which may be translated in English as) "I just can't believe this! ", he shouted in disbelief each and every single time he got the right call and got hammered by bad dice rolls or unmerciful Short Gain readings against him. We'd like also to remember also a former champion of our league, Pierluigi Masia, who also have been the youngest member of the IFL, was also the agitator of the league, for years got everuody mad with his awesome excuses he invented, to the point Commissioner Novello and the President of the Rule Committee Salvadego, have kept a detailled notebook recording all the stories he invented for the future generations! Who's Who of the IFL page is the place to go right now!